Please note that ALL participants must sign-up through a unit and ONLY the designed unit leader for this event (or his/her designee) should complete the registration. Prairielands Council is utilizing Tentaroo as the registration system for this event. For questions, please contact Susan Coller at 217-531-0219 or susan.coller@scouting.org. There is an early-bird price for this event of $35/participant if registered and paid on time by Thursday, September 13th. The on-time fee is $38/participant if registered and paid by Saturday, September 29th. The late fee of $45/participant will be charged for registrations and payments received between Sunday, September 30th and Friday, October 12th. Game day registrations are not permitted. Payment can be made online via debit/credit card or e-check, in person at the Prairielands Council office, or via check by mail to Prairielands Council at 3301 Farber Dr, Champaign, IL 61822. Please note that there is only one price for the event whether or not you plan to attend the game or already have a ticket to the game. Each participant will receive a game ticket to be picked up the day of the game from the registration tent. More event information is provided below. Please check back regularly for updates as the event approaches! Event Overview - The Fighting Illini Scout Camporee will officially start with check-in the morning of Saturday, October 13th and conclude the morning of Sunday, October 14th. An early camping option is available Friday evening at Camp Drake for an additional fee detailed below. The event is being held in conjunction with the University of Illinois football game against Purdue. The cost for this event is $38/participant (with an early discount of $3/participant and a late fee of $7/participant as outlined above) and includes a game ticket, dinner voucher, patch, movie on the big screen, and camp out at Memorial Stadium. This event is open to Cub Scout Packs, Boy Scout Troops, Venture Crews, and any other registered Scouting unit including Girl Scouts. Additional activities will be included near the check-in area as part of this event. Scouts, Scouters, families, and potential Scouts are all invited to attend this event as part of a registered BSA unit. Important Information - The following items will not be allowed for camping on Saturday night in Memorial Stadium: tent stakes, chairs of any kind, tables, cots, anything else heavy that could create an indentation into the field, knives, stoves, fuel lanterns (battery powered lanterns are okay), flames/flammables, firearms, explosives, alcohol, drugs, or tobacco of any kind including e-cigarettes. Please note that the entire University of Illinois at Urbana-Champaign is a smoke-free campus. As such, no tobacco products may be used on university property. Medical Forms - Parts A & B of the standard BSA medical form (available by clicking here) are required for this event. A medical form for each participant (whether or not they are a registered Scout or Scouter) should remain on file with the unit leader at all times during the event. Event staff will not require a copy of the medical form to be turned in. Event Waiver - ALL participants (youth and adult) will be required to sign a waiver from the University of Illinois. A parent or guardian will be required to sign the form for anyone under 18. Click here to download a copy of the waiver. All completed waivers can be scanned and emailed to susan.coller@scouting.org and/or brought to the event. Friday Night Camping Option - Units who would like to camp the night before the event will be able to on Friday, October 12th at Camp Drake for an additional fee of $25/campsite or $40/cabin. Camp Drake is located near Danville, IL and is within an hour's drive of Memorial Stadium. Specific camp sites will be assigned by event staff and are issued in order of registration. When at camp, vehicles must be kept on roads at all times and no vehicles are allowed in campsites. Event staff will be onsite to help coordinate your arrival between the hours of 5:00 pm and midnight CDT. Accommodations are available for individuals in need of electricity (such as those who use a CPAP). Parking for the Event - Participants will need to follow University of Illinois football game parking procedures for this event. The 2017 parking map is available by clicking here. Anyone who already has a parking pass is free to use it. 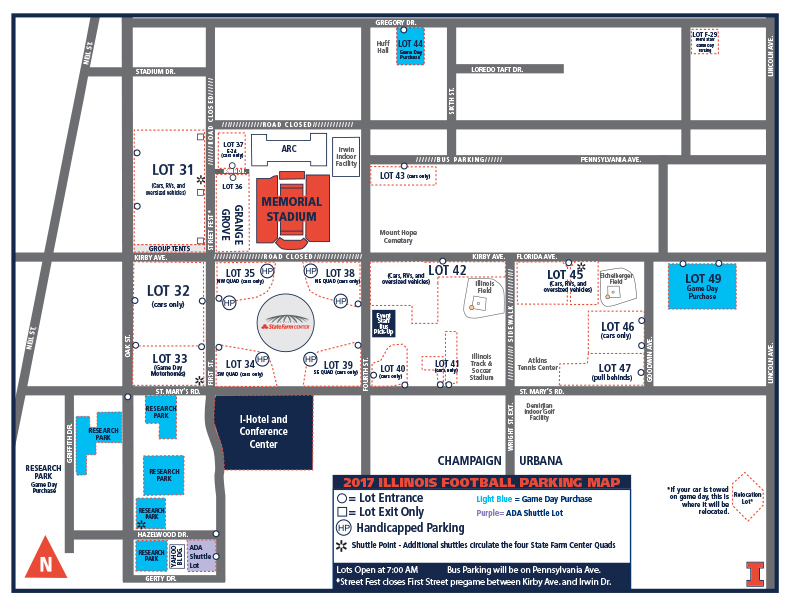 If you do not already have a parking pass, parking will need to be purchased upon arrival at one of the light blue lots identified on the map. The cost for parking is $20/vehicle, $40/vehicle with a trailer, and $50/bus. After the game, vehicles may be moved to Lot 36 or Lot 31. We recommend packing and bringing only what is needed for this event. Parking lots open at 7 am, so please do not plan on arriving before then. Event Check-In - Check-in will be at a tent at the south end of the basketball courts on the northwest corner of Lot 31 and will open at 9 am on Saturday morning. Units may stop by the registration tent through kick-off. Information packets will be handed out upon check-in and these will include game tickets, food vouchers, patches, and event identification wristbands. We ask that only person per unit pick up the packet and handle distributing the contents to participants. Pre-Game - After check-in and until the game starts, there will be activities available just north of the check-in tent. These activities will utilize the basketball courts, sand volleyball courts, and the intramural field located at Stadium between Oak and First. In addition, the University of Illinois will have a variety of family friendly activities open around Memorial Stadium including inflatables, face painting, performances by the Marching Illini, and the Illini Walk as the Illinois football team enters Memorial Stadium. For more information, including what you can bring into Memorial Stadium for the game, please visit the Memorial Stadium website by clicking here. Please note that the ONLY bags allowed into the stadium are clear plastic bags. For more information, click here. Gates to the stadium will open 90 minutes before kick-off. Pre-Game Flag Ceremony - Unfortunately this opportunity is not available this year due to the Homecoming festivities. We anticipate being able to offer it again in the future. Game Time - The game time has been set for 2:30 pm. Units may show up to the registration tent as early as 9:00 am on Saturday morning to pick up their packets which will include game tickets. Game Ticket and Wristband - Only a valid game ticket can be used to enter Memorial Stadium for the football game. The event wristband will be required for entry to all of the other activities at this event. Tickets and wristbands will be included in the information packets handed to leaders at check-in. All Scouts and Scouters are requested to wear their Field (or Class A) Uniform from pre-game until the start of the movie except while participating in activities. Lunch Options - There will be several lunch options available for units. Champaign-Urbana has a number of fast food and sit-down locations to eat. If choosing this option, we recommend eating more than two hours before kick-off and/or choosing locations further from Memorial Stadium to avoid delays. Units may also cook in the parking lots using a grill or above ground fire pit to cook. If you'd like to eat in the stadium, food in clear plastic bags and sealed bottles of water 20 oz. and smaller may be brought into the stadium. Post-Game - After the football game, all event participants will proceed to the intramural field at Stadium and First for dinner. Event staff will help lead the way there. Vehicles can begin to be moved from the parking spots during the game to Lot 36 or Lot 31 shortly after the game as space is available. Dinner Voucher - A dinner voucher will be included for each participant in the information packet. Dinner will be served at the check-in tent immediately following the game. Dinner will consist of a large slice of pizza, an individual size snack bag, a dessert item, and a can of soda or bottle of water. Gluten free pizza is available for those with allergy concerns. Re-Entering Memorial Stadium for the Camp Out and Movie - Approximately two hours after the game ends, event participants may begin re-entering Memorial Stadium with their gear for the evening through Gate 24 located at the SW corner of Memorial Stadium. A wristband will be required for re-entry. Please note that certain areas of Memorial Stadium including both the north and south end zone seats as well as the east concourse and seats and elevators will be considered closed during the event. We ask that leaders assist in ensuring Scouts stay only in designated event areas of Memorial Stadium including the west concourse, lower west bleachers, and the field after re-entering the stadium. Please note that everyone must be inside Memorial Stadium by 8:00 pm and the doors will be closed at that time. No one will be allowed back in prior to 6:30 am without the prior approval of University personnel. Movie - The movie Air Bud: Golden Receiver will be shown on the big screen inside Memorial Stadium after participants have had a chance to set-up tents on the field. The tentative start time for the movie is 8:00 pm and could be adjusted depending on the game timing. Stadium Lights - The stadium lights will be turned off for the remainder of the event when the movie starts. Concourse lights will remain on throughout the night. Please bring a flashlight to help you walk safely around the field. Lights Out - Lights out for this event will be 15 minutes following the end of the movie. Event Ends - Everyone must be out of Memorial Stadium no later than 7:00 am on Sunday, October 14th. Questions - Any questions can be directed to Susan Coller at Prairielands Council at susan.coller@scouting.org or 217-531-0219.